Presentation prepared by Joe M. Bradford, Research Leader, USDA-ARS, <?xml:namespace prefix = st1 ns = "urn:schemas-microsoft-com:office:smarttags" />SubtropicalAgriculturalResearchCenter, Weslaco, Texas. Study objective: to develop sustainable and organic production systems for 1) improvement of soil quality and health within the pecan orchard, 2) increased productivity of pecans, and 3) improved nut quality. Objectives of the project include the management of weeds, insects, diseases, and soil fertility, by minimizing or eliminating the need for synthetic fertilizers, herbicides, insecticides, and fungicides. The research approach is based on the assumption that by first improving soil health, plant resistance to outside stresses, such as heat, diseases, and insects, is increased. We will accomplish this by: 1) achieving mineral nutrient and microbial balance in the soil, 2) using organic foliar sprays to supply nutrients and to control diseases and insects, 3) using soil organic amendments to improve water relations and soil structure, and 4) controlling weeds with a combination of cover crops, mulches, and mowing. 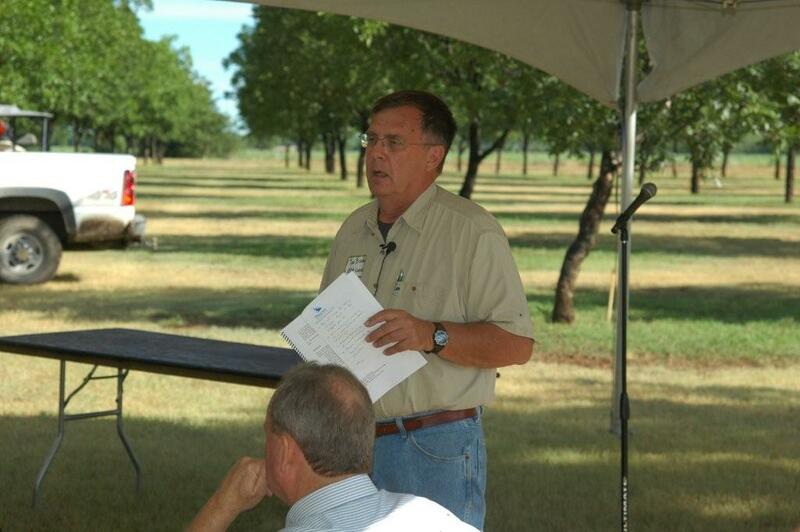 The experimental site is located on the Sonny and Noreen Gebert pecan orchard located in Comanche County, Texas, north of the small village of Lamkin on Highway 36. Soil properties across the study site are somewhat variable. They include Leeray clay (fine, montmorillonitic, thermic Typic Chromusterts), 0 to 1 percent slope; Abilene loam (fine, mixed, thermic Pachic Argiustolls), 0 to 1 percent slope; and Pedernales fine sandy loam (fine, mixed, thermic Udic Paleustalfs). (See Soil Survey of Comance County, Texas, December 1977, Sheet 61.) The soils are typically deficient in sulfur, phosphate, calcium, potassium, boron, iron, manganese, copper, and zinc. Soil test recommendations call for about 500 pounds/acre of soft rock phosphate, 2000 pounds/acre of gypsum, and 250 pounds/acre of potassium sulfate. The soils at the site have excessive amounts of magnesium, with a ratio of calcium to magnesium of about 2.5 to l. Soil pH varies from 7.0 to 7.8 and cation exchange from 20 to 30 meq/100 grams soil. One portion of the orchard (the east one-half) was planted in 1981; this part remains managed conventionally with synthetic fertilizers and pesticides. Varieties are Desirable, Wichita, Cheyenne, and Choctaw). Neither the soil nor the trees have been sprayed with compost tea. In 1986 another section, the west section, was planted. Research was begun at this west section by USDA-ARS Agricultural Research Service in November 2002 to convert to certified organic. The study orchard contains five pecan varieties (Desirable, Caddo, Wichita, Pawnee, and Cheyenne) in 38 rows varying from 11 to 12 trees per row, except for 3 short rows of 6 trees each. Each row is of one particular variety. Each experimental plot was 1000 sq.ft. area surrounding each tree. Radius of the area was 17.8 ft. Number of soil treatments depended upon number of trees within each variety. For example, Desirable variety had only 3 treatments; Caddo, 4 treatments; Wichita, 9 treatments; Pawnee, 10 treatments; and Cheyenne, 15 treatments. Treatments were randomly assigned to each experiment plot or tree. Number of blocks or replications in a randomized block design varied from ten to twelve depending upon variety and soil treatment. Soil treatments were applied either once or twice per year to each tree or experimental plot, normally in late February and June, depending upon treatment. Soil treatments are presented later. Zinc requirements were met by one soil application of zinc lignosulfonate at 5.0 pounds of zinc per acre and three foliar applications at 0.8 pound per acre per application. Soil biology was enhanced by three soil applications of brewed compost tea or black worm casting extracted tea at 20 gallons per acre per application. For insect and disease control and improved plant health, the above-ground portion of all trees in the organic study orchard received foliar treatments of compost tea through monthly applications in May, June, July, August, and September. Rate of application was 20 gallons per acre per application. Both orchards were irrigated with mini-Wobbler emitters positioned about 12 inches from the base of each tree. Soil Treatment Description: Treatments changed somewhat from year to year. Those treatments giving lower yields or having excessive costs or requiring excessive labor were considered for elimination for the following year. Due to time limit in presenting the results, we will discuss treatments for only one variety, Pawnee. 1000 lbs/acre spread on soil surface in March and June following Aer-way tillage across the entire orchard. N-P-K for poultry litter is 4-2-2. In 2007 a third application of 1000 lbs/acre of poultry litter was applied in early September. 4. Compost. 10 tons/acre per application spread in December and June over the 1000 sq.ft plot area surrounding each tree. 5. Gebert Control. – 261.4 lbs/acre (per application) ammonium sulfate (21-0-0- 24) applied in applied in February, June, and September. Equals 55 lbs of N per application or 164 lbs/acre/year. 7. Poultry Litter – Same as #1. Poultry litter twice annually @ 1000 lbs/acre. 8. Poultry Litter + Mycorrhizal Fungi. Poultry litter (1000 lbs/acre or 22.3 lbs/1000 sq ft. in February and June) – spread on soil surface following Aer-Way tillage. Mycorrhizal fungi – 2 ounces per 1000 sq ft on soil surface following Aer-Way tillage. 9. Biological System (one application in March). - 1 pint/acre (473 ml) zinc chelate = 325 ml for 30 trees. In 2006, the biological systems for 2005 and prior years, as shown in Tables 2 and 3, were changed to the treatments as shown above (2008) and in Tables 6 & 7. Biological system #M was changed to the Albrecht Organic Balance. Biological system #C was changed to Poultry Litter + Rock Minerals. Biological system #G was changed to Poultry Litter + Compost. Reason for the change was that two of the treatments were not certified organic products and two treatments required excessive labor in establishing and maintaining on a tree by tree application.. In 2007, treatments were identical to those of 2006 with the exception of treatment #7. The microbes were incorporated into the poultry litter fertilizer at the industry plant. The old (conventional) orchard and the organic research orchard have three varieties in common: Desirable, Wichita, and Cheyenne. Nut samples were collected from four randomly selected trees from each of the three varieties in the old orchard and from trees with the poultry litter treatment in the research orchard. Nut weight (grams/100 nuts) and kernel weight were determined and reported in Table 8. Following the 2007 harvest in November, soil samples (0-6 inch depth) were taken from four soil fertility treatments and sent to the Soil FoodWeb laboratory in Corvallis, Oregon for counts of active bacteria, total bacteria, active fungi, total fungi, hyphal diameter, flagellates, amoebae, ciliates, and nematodes. Analysis procedures can be found at www.soilfoodweb.com. Results are reported in Table 9. Table 1 indicates the yearly rainfall average. Below average rainfall occurred in both 2005 and 2006; calendar years 2004 and 2007 were above-average rainfall years. During periods of rainfall deficit, the orchard received sufficient irrigation to meet crop water use requirements. Due to limited time, only the Pawnee pecan yield data for 2005, 2006, and 2007 are presented and discussed (Tables 2-7). Pecan trees are alternate bearing trees having a heavy crop one year followed by little to nothing the next. Both 2005 and 2007 were the greater yield years and 2004 (data not shown) and 2006 were lesser yield years. In 2005 and 2007, the poultry litter + mycorrhizal fungi treatment gave the greatest yield and was significantly greater than the control (conventional synthetic fertilizer program, but will soil and foliar applications of compost tea). In the low-bearing year (2006) the compost treatment resulted in the greatest yield; but due to the extreme variability among trees within a treatment (coefficient of variation CV=102.3 compared to CV=30 or 2005 and 2007), no significant differences among treatments existed. Table 8 gives 2007 harvest results comparing both nut weights and kernel weights for three pecan varieties for four randomly selected trees in the conventional (old) orchard and the organic orchard. From the organic orchard, harvest results represent four randomly selected trees managed under treatment #1 (poultry litter alone). For each variety, the organic trees greatly exceeded the conventionally-grown trees for both nut weight and kernel weight. Whether managed as conventional or organic did not influence percentage kernel in the nut. Table 9 gives the soil foodweb results for the old (conventional) orchard, and for three treatments in the organic orchard (treatment #1-poultry litter; poultry litter + compost-treatment #6; and the Gebert control-treatment #5). Differences in the conventional treatment and the control treatments are the control treatment received a synthetic chemical fertilizer program + both soil and foliar compost tea. The conventional orchard treatment received chemical fertilizers and chemical pest control and no compost tea. Statistical analyses were not conducted on the data due to insufficient replications and extreme variability among sample results within a treatment. However, microbial counts for each of the eight variables were greater in the two organic soil treatments as compared to the conventional and control treatment. Assuming conventional pecans sell for $2.00/pound and organic pecans sell for $3.50/pound and assuming 35 trees per acre, the gross harvest returns for the 2007 Cheyenne crop increase from $2,337/acre for the control treatment to $5,523/acre for the top yielding treatment (Poultry Litter + Mycorrhizae) or an increase of $3,185/acre. Using the December 2007 prices at www.amazon.com at 5 lbs for $36.00, the increase is $9,025 per acre for certified organic pecans. 1. Prior to establishing a new fruit or nut orchard, greater attention needs to be given to the establishment of a legume/grass cover crop. Reason: greater soil microbial diversity, greater plant diversity, increased organic matter, fixation of nitrogen, etc. 2. When planting new orchards (pecan, citrus, peach, etc.) always sprinkle granular or spray liquid mycorrhizal fungi on the tree roots and (depending upon the soil test results) incorporate poultry litter @ no greater than 1000 lbs/acre in the upper soil layers (or as a substitute feather meal + compost). Apply compost tea both as a soil amendment and as a foliar spray monthly for disease and insect control. 3. In general among all varieties in the Gebert experimental organic orchard, applications of 150 lbs/acre nitrogen from three applications of ammonium sulfate (the conventionally managed control) resulted in the lowest yields for the 2005 Pawnee harvest; whereas application of 1000 lbs/acre poultry litter applied twice yearly with mycorrhizal fungi gave the greatest pecan yield. 5. Pecan casebearer was effectively controlled with release of trichogramma wasps and one foliar application of 0.2 oz/acre spinosad. In 2007 trichogramma wasps were not released. The net result was heavy infestation of generation III casebearer. Major damage was on the Cheyenne variety pecans. 6. Pecan weevils appear to have been controlled with soil applications of compost tea. In 2007 there were few weevils and in 2008 there were no weevils. 7. Aphids have not been completely controlled but with greater concentrations of plants oils, citrus, neem, and karanja oil as an alternative control, we expect to have a better control of aphids in 2008. In 2008, we will release lacewings during the growing season. 8. Pecan scab was partially controlled with compost tea. With increased concentrations and additions of a spreader/sticker, we expect better control in 2008. Visual observations indicated greatly improved tree health through the application of compost tea, as compared to the conventionally managed, adjacent pecan orchard; this improved health results in improved disease control. Scab was most severe on the Wichita variety. 9. Other diseases and insects have not been a problem. We believe this is due to improved soil and tree health. 10. I have been experimenting for years in controlling diseases on the roses in my front yard in Harlingen, Texas. Through intermittent applications of either brewed or extracted compost teas, rose diseases have been partially or completely controlled. I do not spray for months and allow the diseases to re-occur, and then return to the compost tea program. The result is always the same – diseases are controlled. Conclusion: compost tea must be a part of any organic management system. 11. The best source of zinc is zinc lignosulfonate. It is rapidly transported within the plant. The key to developing a successful organic production system is recognizing that it is a system with multiple interactions among all the system components. A change in one variable results in a change in other variables. So then, where does one begin? 1. First, you must begin with the soil component. Increase the soil organic matter. Balance the soil nutrients. “Balance the soil microbial populations. This results in improved soil and plant health, which creates a greater plant resistance to insects and diseases. 2. Then if plant health is not achieved, use foliar sprays, such as zinc lignosulfonate (to correct zinc deficiencies) or humates or fish emulsions or seaweed and compost tea, to further improve plant health. Disease and insect control then becomes easier to accomplish. 3. Then you look for further methods to control insects through the release of beneficial insects and insect habitats and diseases through foliar sprays. One reason that conventional, synthetic chemical growers fail in their attempts to convert to organic is their failure to recognize that organic production is a system. They attempt to test one component or one product of the system and this results in failure. For example, one cannot successfully control plant diseases just by trying a particular organic spray. Soil and plant health must first be established. Today, the field day concentrates on pecan production. However, the principles laid out apply also to vegetable production, to peaches, to apples, to apricots, to citrus, to pasture management, and to all plants.